The trend is not new. 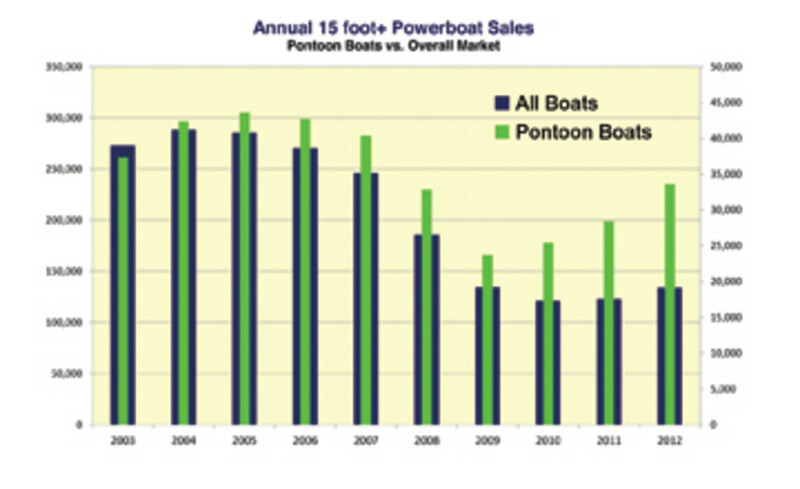 Pontoon boats have been gaining in popularity for about a decade, but since 2009 the segment has far outpaced others in speed of recovery. Aluminum was a growth market in 2012. For the year, sales in the main powerboat segments gained 11.4 percent to 125,544, and leading those segments were two aluminum categories: pontoons and fishing boats, according to data from Statistical Surveys. Pontoon boat sales climbed 20.4 percent for the year to 33,798, and fishing boat sales rose 9.3 percent to 37,623. 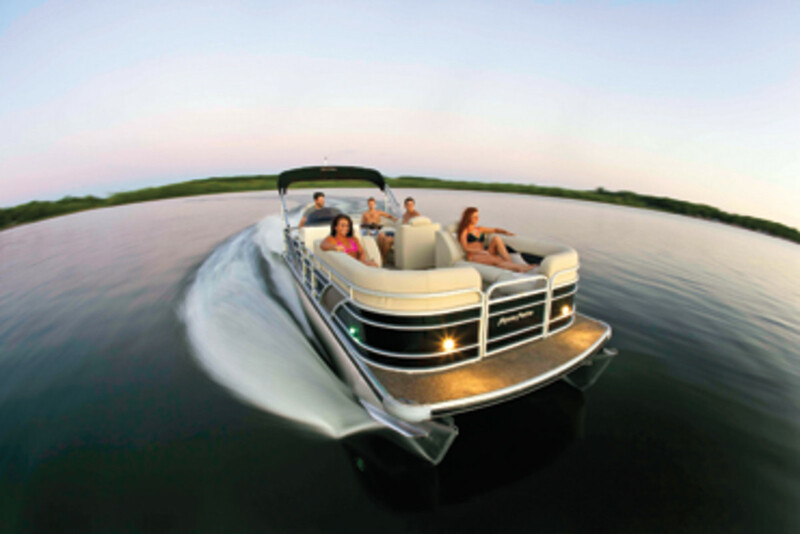 A number of factors have come together to create a perfect selling environment for pontoon boats — value, versatility, capacity, the aging boating demographic, performance and handling improvements, and the recession. It’s a trend many say will continue to grow, even in saltwater markets previously regarded as unreceptive to the aluminum segment. “Pontoons went from something that was seen as a tired boat for old people to a really cool boat that is a good value,” says Steve Tadd, director of marketing for Elkhart, Ind.-based Nautic Global Group. 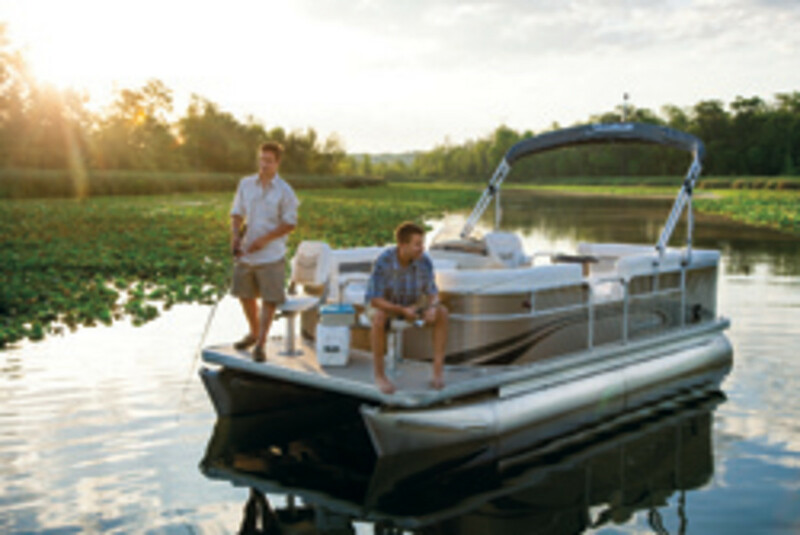 Nautic builds the Godfrey and Parti Kraft pontoon brands, in addition to Hurricane Deck Boats, Polar Kraft aluminum fishing boats and Rinker fiberglass sport boats and cruisers. “It’s a growth segment, that’s for sure,” says Bruce Wright, general manager and vice president of New Hampshire-based Irwin Marine, which carries the Berkshire brand. “We’re seeing some people transitioning out of runabouts and into pontoons as the quality and sophistication have improved. People want one boat to do everything, and now we’re able to make that happen.” Buyers also are getting younger, Wright points out. Some dealers speak of an exodus from runabouts to pontoons, but Ellis and colleague Peter Houseworth say that is happening no more frequently today than in the past. “There are definitely people who sold their sterndrive boats and bought pontoons, but the incidence of that did not increase,” says Ellis. “We don’t have a solid explanation why, but they [sales] really took off after 2009.” He and Houseworth speculate that an aging boating demographic, along with versatility and affordability, has helped the shift along. But there is no question pontoon boats have increased in popularity. The accompanying Info-Link graph reflects the segment’s growth relative to the overall market for powerboats 15 feet and above. In 2012, for example, 134,169 boats in that size range were sold — 33,615 of them pontoon boats. That remains below the pontoon sales peak of 43,642 in 2005, when overall 15-foot-and-up boat sales totaled about 285,502. Though the boats traditionally have been used primarily in fresh water, more pontoon builders are offering saltwater packages, as the boats gain popularity in brackish and saltwater areas. Connecticut-based Beacon Point Marine, with locations in Cos Cob and Shelton, picked up the Bentley pontoon line about a year ago. Sales manager Richard Peterson thought they would be more popular in the Shelton location along the brackish Housatonic River than the Cos Cob location, whose harbor is on Long Island Sound. All of Bentley’s boats are available with a saltwater package, Peterson says. That consists, in part, of bottom paint designed for aluminum and anodized rails. Premier has always built its pontoons for saltwater use, Menne says. “We’re selling a fair amount of our boats in salt water, and people don’t have to be concerned about the wiring failing and the fasteners corroding,” he says. 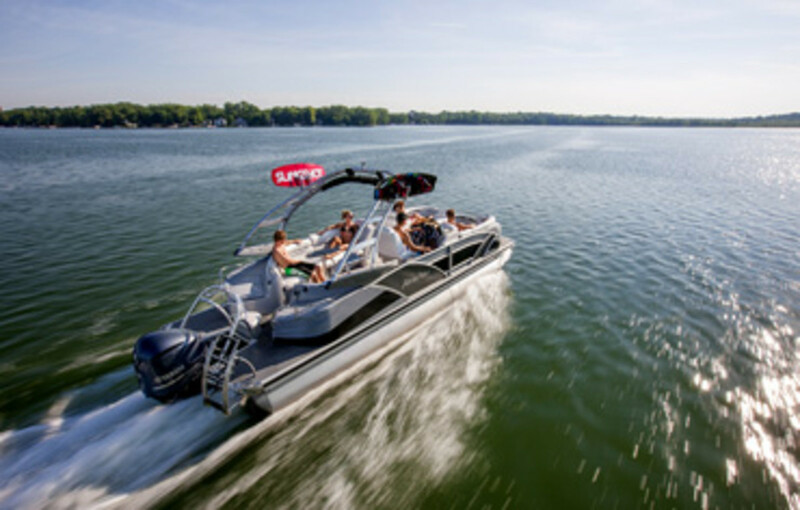 The most popular pontoon boat to wind up in those markets is the triple-tube, or tritoon, Menne says, because the ride is much better. During the last five years, Premier has added several dealers in saltwater markets and has seen significant growth in parts of the Northeast, southeast Florida and some areas of California, Menne says. Most of the growth, however, is concentrated in places where pontoons have always been strong, Houseworth says. “My speculation was that it was growing into other geographic areas, but a lot of the growth seems to be concentrated in markets that have always had strong pontoon sales,” he says. The recession also helped pontoons grow in popularity because it prompted consumers to take a hard look at value, Tadd says. The pontoon offered more deck space, more capacity and more seating options than other types of boats at a lower price than is traditionally associated with that capacity. “There was that value message that could be sent, and it attracted lot of people to pontoons, relative to other types of boats,” he says. Families with young children and the aging population appreciate the ability to move around on a pontoon, Menne says. “We’re seeing more and more people with pets on the boats, as well as seniors, young people, old people — they all enjoy it,” he says. Pontoon boats are considered much more easily adapted for handicapped access than other boat types and are easier to board and debark, which industry leaders say is increasingly important to an aging demographic. Much of the credit for the pontoon boat’s enhanced performance, speed and handling should go to engine manufacturers, Menne says. The quieter rides those new engines deliver help people to communicate, a key function of the pontoon, he says. The triple tube also has greatly improved the handling and ride, he says. Perhaps even as important, the boats just look better, Tadd says. “Five years ago virtually every pontoon was beige. Now they’re all different colors,” he says. Menne thinks the gravitation toward amenities also will evolve. “We’re selling a lot of big boats, and people are not shy about spending a lot of money on a pontoon boat if that’s what they want,” he says.